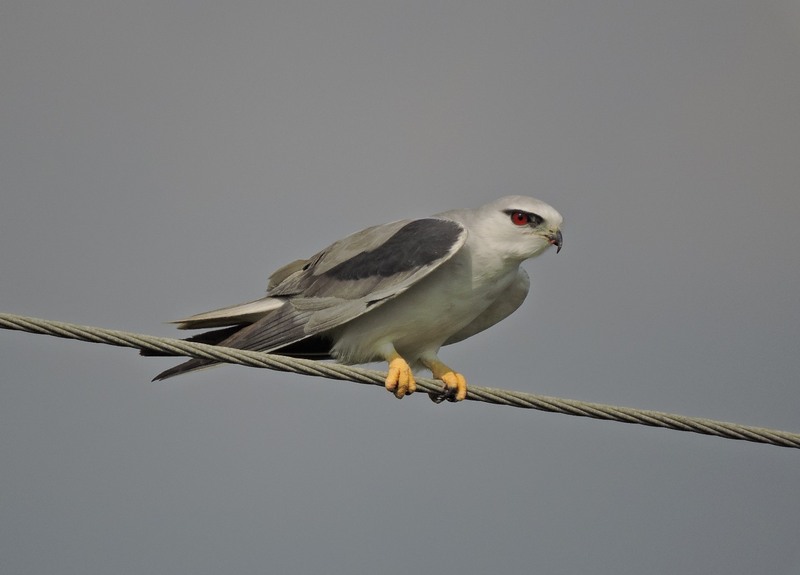 I have been confusing the Black-Winged Kite with her Black-Shouldered cousin in Australia . Only a week ago did I realize this. I ought to be flagellated and forever sentenced to spend more time with people than with birds. Well, maybe not the latter. That would be cruel and unusual punishment. Similar to death penalty verdicts in India. The Black-Winged Kite is a one of the smaller members of long-winged raptors. She is a resident in my city, and in many tropical parts of Asia. They aren’t common hill-dwellers. But high-altitude places in India such as Nilgiris and Nagaland have documented her presence. She looks like a character out of an animated film. With sharp crimson eyes inside black frames, she thirsts for bloody sunsets. Her grey-and-white plumage wears a fresh coat of paint every other season. It’s why she seems fashionable all the time. And her tail-feathers look like hand-crafted Chinese fans. Her long wings spread out impressively as she takes off. It is a sight to behold to watch her soar high. When it comes to hunting, she is a hover-and-attack sort of girl. She hovers above her prey, analyzing the need for speed, before she swoops in for the kill. I have seen her prey on rodents and frogs before. Even a mid-air attack on a flock of bulbuls. But I have managed to photograph her just once during a hunt. I was birding along a stretch of the highway in my city’s outskirts. And I heard her call. Raptors aren’t always easy to identify by sound. They alternate between faint whistles and piercing squeals. That day I had a squealer for company. By the time I could spot her, she was tearing into the soft flesh of a rodent while perched upon a wire. I pointed the camera at her, and held it still for some time, to see if she would react. She didn’t. And so I felt at ease, and started photographing her. I got a few good ones of her with the prey. A minute later, she turned around, with most devilish grin, to look at me and took off. I base most of the information about birds I provide here on reported facts. I also believe that every birder finds something unique that only he/she can understand. In this case, it is my belief that Black-Winged Kites grin a lot. It is evident in many of the photographs I have taken of them. Maybe they were aware that I was referring to them as Black-Shouldered Kites. And they found it silly yet inoffensive. And thank you for the great poems and pictures we get to read from you. Merry Christmas, Christy! thank you mamta, season’s wishes to you too! Awww, thank you, C. You beautifully uncanny person! Graciously said. I look forward to more word magic. thank you sire, as I look forward to yours! And thank you for the beautiful pictures and poems and those hilarious lists!!! 🙂 Have a fulfilling last week of 2014! Thank you for gracing us with your work. Gracias, Lita. Pleasure’s been mine! 😀 Yeay Year…I hate stats…numbers…and the relatives of the same clan. But I enjoyed your graph her on WP 🙂 Keep it up comrade. Keep the works soaring high as always! 😀 Hahahha…healthy is the choice! past mistakes” Brilliant. Thank you so much for your poetry, keep soaring! Lovely pictures and words to go with them… 🙂 So glad to find your blog. Great capture on the kite. We have a similar species living in our trees at home call the Mississippi Kite. I’ve not been able to get so good a shot…yet. Perhaps with my long lens next year. Glad to have found you here; I perused the WP tag on “birding.” I’m rarely disappointed by whom I find in that fashion. Aint that the truth comrade, birders always have their chins up. Just goggled the Mississipi Kite, she’s a beau, hope your lens has several love affairs with her in 2015. And gosh thank you for the lovely comments, tis an absolute pleasure. What an oddly gorgeous bird! and she sounds like she swallowed a flooded whistle. such a lovable oddity. Also, how on earth did you reach 5,000 people in a couple months?! Seriously. How??? aww shucks in-between the nice people who come here and (psssst lean over) WordPress tags, i’m just a happy dodo! I don’t believe you. There’s magic afoot here, I know it. i started birding since feb 2013, i think i am yet to get over the sheer thrill of it. i spot birds by tracing falling leaves to their sources, and poop. yep. they poop a lot and I trace those too. Yes but can you make their beautiful sounds? just four so far – the red-whiskered bulbul, spotted owl, jacobin cuckoo and the laughing thrush. do you have bulbuls in your city/space? they are fun to mimic and not too hard either. dáww you can check online for the local birds in your area and try to find them. there could be adventures in there for you! Keep ’em coming. I’m enjoying regular blog-reads in the mornings and around lunch (like now). It’s nice to be back. She is just gorgeous. Love her steamy red eyes and wicked grin. Quite the flirt with the camera (love the third one in the second set of shots). Wicked grin yes! I bet if I had kept really quiet I might have heard a chuckle too. She really is wonderful. I am glad you do Shannon ❤ a treat and fishbowl of cherries to have you back. Awww love birds hmm giggles invite some Drongos over. They always get into it with these kites and end up winning by being rowdy and loud.